Violinist Soovin Kim plays Wolfgang Amadeus Mozart’s Flute Quartet in C Major, K. Anh. 171 (1778) at the Marlboro Concert Hall on Saturday, July19th, 2008. Soovin Kim, David Soyer, and Mistuko Uchida star in a marvelous performance of Schubert’s Eb Major Piano Trio in a 2008 performance from Marlboro. 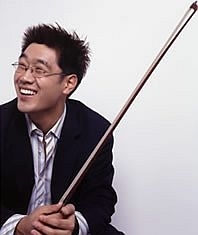 We’ll hear today from violinist Soovin Kim about his experiences at Marlboro – and you may be surprised at what he has to say. Also, a 2004 recording from the festival, featuring Soovin playing 1st Violin in Maurice Ravel’s String Quartet.